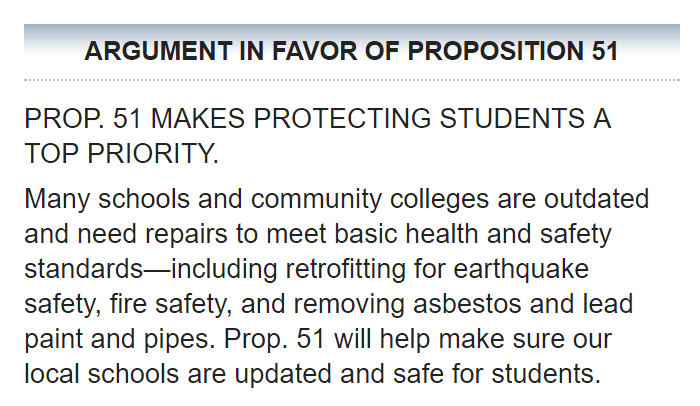 Proposition 51, a statewide ballot measure, is being billed as a $9 billion school bond project that will fix leaky roofs and remove asbestos from classrooms. Those priorities were also front and center in the ballot language for Prop. Z, a local bond passed in 2012. Tens of millions in Prop. Z money has also been spent on stadiums. Prop. 51 funds could also be used to fund stadiums, the state Legislative Analyst’s Office told us. If San Diego is any guide, Proposition 51, a statewide ballot measure billed as an effort to fix and improve school facilities, could lead to lots of new football and athletic facilities across the state if passed. The ballot measure says $9 billion will be spent on leaky roofs, asbestos, air conditioning and lead paint – all projects that lack adequate funding. Stadiums aren’t mentioned at all, but the money could still be spent on new football and other athletic facilities. That would be a familiar outcome to anyone who remembers San Diego Unified twice promising to fix that same list of needs, and proceeding to spend more than $100 million building stadiums and other athletic complexes over the last seven years. Prop. 51 money could go toward stadiums because “the rules of the state’s existing school facility program would apply to these funds,” according to the state’s impartial Legislative Analyst’s Office. Since the state’s current School Facility Program can help pay for stadiums and sports fields, among other things, the new money can go toward those kinds of projects too. The State Allocation Board will dole out Prop. 51 money to qualifying projects on a first-come, first-served basis using a per pupil formula. Prop. 51 divides the new money into five broad categories: $3 billion for new construction, $3 billion for modernization of existing school structures, $500 million for charter school facilities, $500 million for career technical education facilities and $2 billion for community college buildings. Sports facilities would likely be paid out of the new construction or modernization budgets, which usually require a local funding split of 50-50 or 60-40, respectively. But the state could fully fund eligible projects for districts in need. “If it was a particularly fancy stadium, there will likely be local money helping to pay for that,” Kaplan said. Community college projects would get processed differently, going through the traditional approval process with the chancellor of the community college system, then get approved by the Legislature and governor in the state’s annual budget. Since different types of construction projects aren’t prioritized over others in Prop. 51’s ballot language, it’s possible classroom repairs could take a back seat to stadium projects. If schools rush the fund for stadium money, California classrooms might never see many of the repairs promised, and buildings could continue to languish and worsen. Such a risk is real, and the ramifications of similar decisions have already been seen in San Diego. Voters here have passed two local multibillion-dollar bond measures within the last 10 years – both touted as measures meant to fix schools and build new buildings. But despite spending more than $1 billion, San Diego Unified’s school facilities are worse than before. Like Prop. 51 facing voters in November, San Diego’s Prop. Z, passed in 2012, singled out asbestos abatement and leaky roofs as urgent needs that new revenue would address. Four years after the bond passed, removing asbestos has become a seemingly small piece of retrofitting classrooms and district officials have said that all schools are safe for kids. Stadiums have taken priority across the district, leaving schools with flashy fields and dingy classrooms. 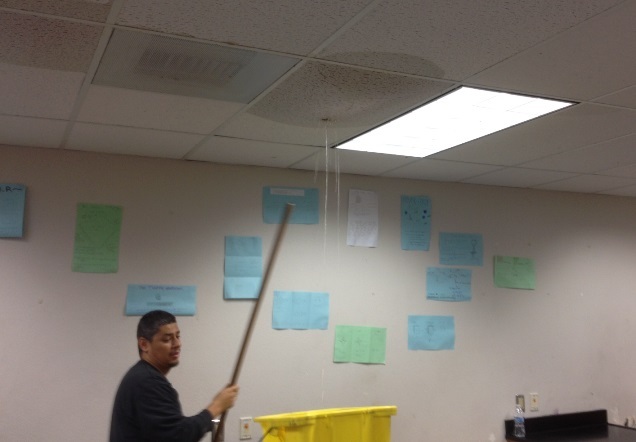 More than $15 million went into a new football stadium and athletic facility at Hoover High, for example, but a custodian there told us last year that at least one classroom has a rotted internal beam and leaking roof that sags with pooled water when it rains. San Diego school leaders have defended their decisions, saying the sports fields are a source of pride for students, building them everywhere is a matter of equity and stadiums are just sexier than things like new plumbing. San Diego Unified isn’t done with its Proposition S and Z bond program and will spend $3.9 billion more in the coming years, but the district is currently a case study illustrating why bond project priorities matter. 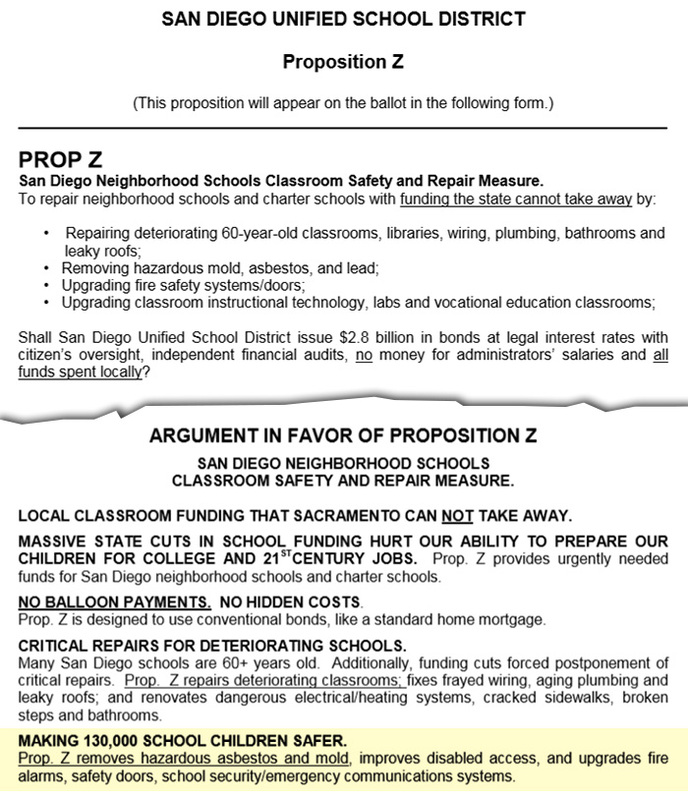 The bonds for San Diego schools will be repaid with property tax hikes local voters approved. With no new tax hikes included in Proposition 51, the state’s general fund – supported mostly by income and sales tax revenues – would be used to repay the new debt. Even though Prop. 51 would fund $9 billion in California school and college facility projects, the total cost to taxpayers is estimated at $17.6 billion over 35 years when bond debt interest is factored in, the ballot measure says. The proposal has pitted California Gov. Jerry Brown against schools chief Tom Torlakson – Torlakson is for it and Brown is against it. San Diego Mayor Kevin Faulconer endorsed Prop. 51 last week. “Passing Prop 51 means that San Diego will get its share of state funds for our children’s educational needs – whether it’s fixing older schools to make them safer for today’s kids, replacing temporary portable classrooms, or building new schools to help relieve overcrowding,” Faulconer said in a statement. When I asked the mayor’s office whether Faulconer would support Prop. 51 money being used to build stadiums, his team instead directed me to the Yes on Prop. 51 campaign. Those in the school and stadium construction business have lined up to support the measure. Sponsoring the Yes on Proposition 51 ballot measure committee is the California Building Industry Association and the Coalition for Adequate School Housing, groups funded heavily by construction companies and developers. Supporters have given the committee $8.98 million, according to the Secretary of State’s office.